How to connect an Android smartphone to LG’s webOS ? Did you know that you can replicate your smartphone’s screen to any LG Smart TV with webOS 3.5? That’s called screen mirroring. It is extremely fast, simple and efficient to use your large TV display to show family and friends content that is on smartphones, without the need of a PC or another storage medium. Basically all that is displayed on the smartphone screen will be played simultaneously on the TV screen. 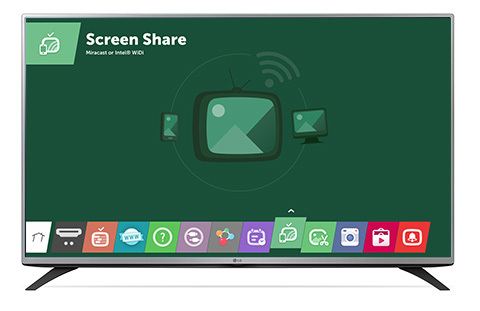 LG Smart TVs with webOS also feature the Miracast function and along with Android compatible smartphone, this facilitates easier access to video content. It is a protocol that can connect a compatible television monitor, using Wi-Fi, to a mobile device. Hence Miracast association with “HDMI over Wi-Fi”, because it ensures very rapid transfer at high resolutions, without the need to use a cable connection between either smartphone / tablet and monitor / TV. What use do you have for the Miracast option? By Miracast you can send the information from the screen of an Android smartphone or tablet to a Smart TV / monitor that is compatible. Possible uses would be: viewing photos, browsing, watching movies, playing games, using applications such as Google Maps or Google Earth, etc. I’m sure you can find plenty of cool ideas to highlight Miracast use. How do I connect an Android smartphone to an LG Smart TV that runs webOS ? First, both the LG Smart TV and Android smartphone must be connected to the same wireless Internet network. The first is to turn on the application Screen Share on the LG TV that has webOS 2.0. From the icons that slide on the bottom of the screen when you activate Web OS, click the icon showing a TV with a Wi-Fi signal over it. It will open a page where you select the Mobile Device option, and follow the instructions on the screen. Now you must go to Settings on your phone and tap Share and Connect (this option can be described differently depending on the smartphone manufacturer – Miracast on the LG or Screen Mirroring for Samsung). The smartphone will begin a search for devices that you can connect with. You should wait until the Web OS LG TV is “seen” by the smartphone. When found, select it by tapping on tv’s name. On the TV screen you’ll see a message asking if you want to Accept or Deny the connection. Now tap Accept the connection. At this moment your smartphone’s display will be mirrored on the TV. You can play video clips, movies, games and more. If your smartphone doesn’t have Miracast or Screen Cast, you can use Chromecast or other dongle to mirror image and sound to Tv. Can you view it in reverse, to see what’s playing on the tv from your smartphone?